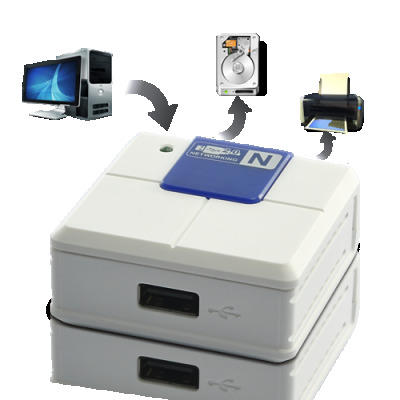 Successfully Added Mini USB 2.0 Switch - Network Share Server (NAS, MFP) to your Shopping Cart. This new palm-sized USB Server enables an external hard drive, flash drive, USB Speaker, memory card reader, USB webcam, USB Multi-Function Printer (MFP) or other USB Devices to be shared on a network. With the versatility afforded by the USB Server, users can now enjoy their favorite multimedia content stored on their computer from anywhere in their home or office. When connecting the USB server to a wireless router, users can access their multimedia content and USB device wirelessly. The UPnP technology enables quick and easy setup and configuration in a Windows environment. With this Mini USB 2.0 Switch you can plug in a new USB External HDD and quickly share it over your home or office network. This provides a lot of functionality, and is much more efficient and quick to set up than investing in a central server to act as a shared HDD space. You can use it as a place to store large files that everyone at home or work needs, thus saving valuable space duplicating those files. It is also a superior solution to using another computer left on all the time as a shared HDD space, because it uses up less power and is a more portable solution. This Share device is extremely easy to set up and use straight away. Use it with your own cabled router or a wireless router to share the USB device connected with all the computers on your network. Connect a variety of different USB devices for sharing. Now you don’t have to worry about not having a spare USB Slot on your computer or setting up different USB devices on separate computers, just share your USB device to all your computers with this great Mini USB 2.0 Switch. Designed to deliver a long-term and dependable network sharing solution, the Mini USB 2.0 Switch is available at a very attractive price. With highly lucrative wholesale savings to be had, you can order this Mini USB 2.0 Switch today and we’ll ship it out tomorrow. A great product for re-selling and dropship orders, considering the current the increase in home and work networks across the world, this product won’t disappoint you; available now from the leader in factory direct wholesale electronics, Chinavasion.